Convenient Spiral Bound Edition lies flat. 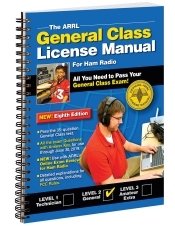 Online Review and Practice Exams As you complete each chapter of this book, use ARRL’s online Exam Review for Ham Radio to help prepare you for exam day. This web-based service uses the question pool to construct chapter-by-chapter reviews. Once you’ve finished this book, use the online service to take practice exams with the same number and variety of questions that you’ll encounter on exam day. You won’t have any surprises on exam day!